Archdeacon Francis C. Cornish ( 1862-1965) – He was the Anglican minister in Gleichen from 1921-22 and worked out of St. Andrew’s Church. Back in 1885 he was the clerk to the Indian Agent in Gleichen after immigrating from Wales in 1884. In 1886 he married a Miss de Balinhard. He wrote his memoirs in 1959 at the age of 97 years old. He was ordained in 1901. His father in law was Major W.C. de Balinhard of the 47th regiment and later an indian agent for the Sarcee. He talks about the building of St. Andrews during his time in Gleichen as a clerk. 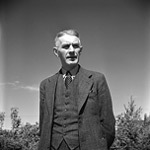 Reverend G. Moore Morgan (1883-1974) – Was the Anglican Minister in Gleichen from 1922-23. Him and his wife Alice Farringer (1890-1973), had four children George, 1914-1942, Margaret Elizabeth (Simpson), 1917-2008, John Emile “Jack”, 1918-2005, and Richard, 1923-2003. George H. Gooderham (1889-1977) – His father was the indian agent in Gleichen from 1878-1919. He took over on his fathers death in 1919 and was the agent in Gleichen till 1946. In 1920 he married a miss Mary Kentner of Toronto, Ontario. They had three children G. Kent, 1927-2003, Elizabeth (Robinson), and Eleanor (Crawford). from 1946 to 1954 he was regional supervisor of the indian agencies. In 1954 he was hired as the first employee of the Glenbow in a historian and public relations position, 1968 when he transferred to the Riveredge Foundation, where he continued his work until shortly before his death in 1977. The above photo came from the Glenbow Archives. The Glenbow has his diaries in it’s collections and he was a prolific writer filling about a volume per year of his life and cover the years 1920-1976.